As lucky as we are to have an abundance of delicious, fresh produce grown throughout California, there are a number of staples that we carry either year-round or beyond their local seasons so you never have to compromise on your meals or the quality of your ingredients. Think hot peppers in the cold months, healthy after-school snacks (like the ubiquitous banana), and salad must-haves (we can’t make Green Goddess Dressing without avocados). We’re proud of the work we do to ensure that our sourcing and quality standards are as stringent as ever when it comes to out-of-season produce. 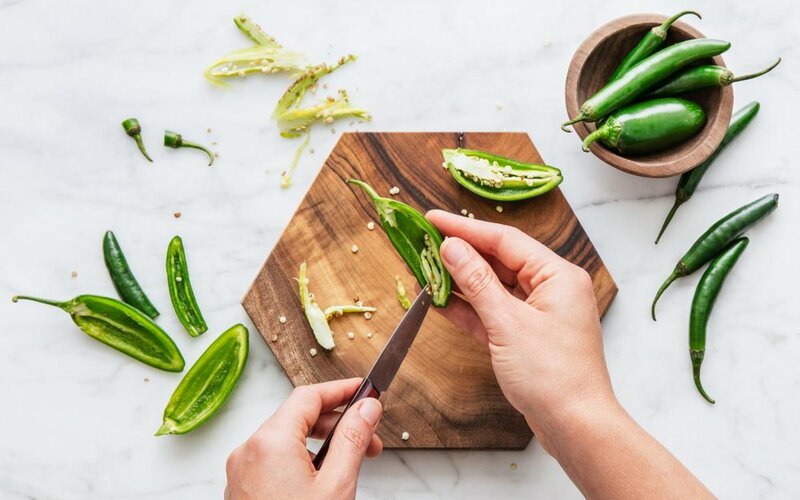 No matter how far your jalapeño has traveled before it arrives at your door, you can rest assured there are no shady steps in the supply chain. First and foremost, we go out of our way to partner with local and regional growers that allow us to keep our coolers filled with California fruits and veggies — even when it might be easier to import them. We have Hikari Farms’ famous Japanese Cucumbers delivered from Watsonville about twice a week through December, for example. And while some grocery stores start selling Chilean blueberries as soon as they can (it’s a profit margin thing), we work with our partners at Forbidden Fruit Orchards in Santa Barbara and Coastal Moon in Watsonville to carry plump freshly-harvested California blueberries year-round. For the most part, Good Eggs carries only certified organic produce. While we make a few exceptions for a handful of small, local producers for whom certification isn’t practical for a number of reasons — like Sonoma’s Oak Hill Farm, whose practices go above and beyond those needed for organic certification — we know that pesticide regulations aren’t nearly as strict in other countries, especially compared to California. That’s why we carry only organic produce if it’s not grown in the US. In fact, we work with export growers — like Covilli Organics, Del Cabo, and Wholesum — that are 100 percent organic operations. We consider the workers who plant, weed, harvest, and pack the produce we sell part of our community, so we care deeply about the conditions that affect them. Organic certification is a big part of ensuring that important standards, like a safe working environment, are up to snuff. It means that farmworkers are protected from potentially toxic pesticides used in large-scale conventional agriculture. But we also rely on various third-party fair-trade certifications to ensure that labor conditions at our grower partners’ farms are beyond safe — they must exceed industry standards. As the Produce Category Manager at Good Eggs, part of my job is visiting the farms that we work with to inspect conditions and ensure they’re up to our strict standards. When I toured Covilli Organics’ farm — Agricola Ciari in Guaymas, Mexico — I saw dozens of signs detailing everything from the basics of the fair-trade program to protections against harassment and discrimination, as well as the processes to report such abuses. We often take these workplace protections for granted here in the US, so we’re lucky to be able to rely on third party certifiers like Fair Trade International and Fair Trade USA to verify that international producers are doing things the right way. At Good Eggs, we’re happy to pay the fair-trade premium (usually only a few cents per pound) to do what’s right for you, your family, and the environment. And we’re able to see the direct impact this premium has on farmworkers and the surrounding community. A democratic, fair-trade committee decides how to reinvest these funds, using them to improve access to healthcare or educational opportunities in areas where such services are lacking, for example, like the clinic just inaugurated by Covilli with Fair Trade Premium funds. The democratic nature of fair-trade committees means that your purchases of fair-trade products help empower farmers, workers, and their communities. And in some cases, that empowerment comes in the form of cooperative ownership structures. The Del Cabo cooperative, for instance, includes more than 1,000 family-run farms throughout Mexico’s Baja California Peninsula. Together, they organize trainings in organic growing, provide administrative support, and ensure the highest possible returns on their product, setting their members up for success. We’re also proud to carry Equal Exchange’s avocados and bananas, each of which come from a cooperative of small farmers in Mexico and Ecuador, respectively. Equal Exchange works closely with these cooperatives to ensure they have a place in an increasingly global marketplace. And in turn, these small farmers — who are often self-employed and growing on their own land — ensure that their farms and the communities they’re part of reap the benefits. So the next time you add a banana, pepper, tomato, or avocado to your Good Eggs basket, even when these staples aren’t in season here in California, you know that you’ll get fresh, organic produce that’s good for you, the farmworkers who made it all happen, and the planet. Anything less just wouldn’t be the Good Eggs way.